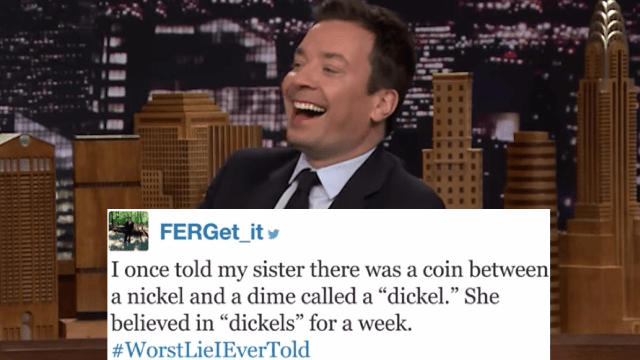 Jimmy Fallon reveals the worst, most hilarious lies his viewers have ever told. Look—everyone lies. Whether you pretend to love your mother-in-law's meatloaf or you say that you don't mind watching countless hours of Grey's Anatomy to appease your significant other, no one is completely innocent when it comes to some light fibbing. However, a few brave viewers decided to expose themselves for the liars they are by taking to Twitter to tell Jimmy Fallon the worst lie they've ever told. Wow, if these are the worst lies these people have ever told, they are honestly pretty saintly. If I had a dickle for every time I told an innocent white lie like these folks, I would be drowning in fictional currency.